Cold-Climate Heat Pumps: Energy-efficient, Cost-effective, Environmentally-Friendly | GSK Climate Control, Inc.
Are you looking for the optimum comfort, energy-efficiency, and peace of mind when it comes to your home’s heating and cooling equipment? Cold Climate Heat Pumps can provide the ultimate comfort and energy-savings, year-round, while utilizing a free and renewable resource – outside air – to condition your space! When you live in a cold climate, such as Vermont, heating your home without spending a fortune on fuel oil, gas, wood, or pellets is a high priority that’s often times difficult to achieve. Cold Climate Heat Pumps are currently eligible for significant rebates through Energy Efficiency Vermont – Vermont’s energy efficiency utility. The catch is- these rebates are only available till the end of June, after which the $600-$800 rebates will be considerably reduced! 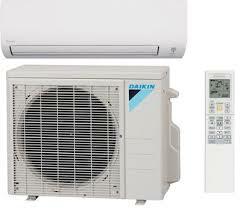 NOW is the best time to consider buying and installing Cold Climate Heat Pumps f0r your home or business, folks!! Heating and cooling your home accounts for approximately 40% of your home or buildings total energy use. With a Cold Climate Heat Pump you can save anywhere from 30-60% on your heating and cooling expenses, depending on the efficiency of your current HVAC system and the type of fuel your system consumes. Imagine cutting that 40% of costs spent on space-conditioning utilities for your home or business in half!! Northeast Energy Efficiency Partnerships (NEEP), estimates that if only 40% of households in New England switched to heat pumps by 2030, over $4 billion in annual energy savings and 50 billion metric tons of polluting carbon dioxide emissions could be saved! By installing a Cold Climate Heat Pump, a typical Vermont family spending $3,000 on propane or oil on an annual basis, could save approximately $1,000-$1,500 each year and cut your fossil fuel reliance by 60-80%!! Properly installed and maintained Cold Climate (Air-Source) Heat Pumps can produce seasonal efficiencies exceeding 300%, meaning the system can deliver up to 3 times more energy than it consumes! As of now, the majority of heating and cooling methods in our region utilize the process of combustion for heat energy which in turn pollutes our homes and environment with nitrogen oxides, sulfur oxides, and carbon dioxide among other toxins. These pollutants negatively impact our air quality, health, water supply, and contribute to greenhouse gas emissions, which deplete the ozone and worsen the effects of global warming and climate change on a large scale. Electrically driven Cold Climate (Air-Source) Heat Pumps offer an energy-efficient, environmentally-friendly, and innovative alternative for space conditioning our homes and businesses without contributing to volatile foreign expenditures on crude oil and gas, keeping local money, in local hands – all while preserving the health and comfort of our families and the world at large. Heat Pumps operate off of electrically powered inverter-driven compressors, which are able to vary their speed based on actual demand. It’s important to note that these systems don’t use electricity to generate heat, which is extremely inefficient. Instead, they use electricity as a means of moving the heat they produce via a typical refrigeration system, which rejects and extracts heat from the ambient air. The compressor’s role is to pump refrigerant between the outdoor system’s condenser and the indoor unit’s fan-coil (a.k.a evaporator). As refrigerant is circulated through the system (via connecting refrigerant lines) it changes state from a high-pressure, high-temperature gas at the indoor unit to a low-pressure, low-temperature liquid at the outdoor condenser. With these resultant changes in state and pressure, the vapor compression system that makes up a Heat Pump, is able to extract heat from even the coldest, sub-zero temperatures outside, where it’s pumped indoors to provide comfortable heat, at the desired temperature. As an added bonus, heat pumps are able to reverse this cycle in the summer to provide your home or business with effective and efficient air conditioning! Heat Pumps run 50% more efficiently than a typical window a/c unit, and they don’t require any labor to install and remove the equipment when the cooling season is over! A heat pump that reverses its cycle for cooling, is able to extract un-wanted heat and humidity from inside, at the indoor unit, and pump it outside, where heat energy will be rejected at the outdoor condenser! This process provides an immediate cooling effect, with the roles of the indoor unit and outdoor unit exchanged. We can thank the study of thermodynamics, physics, & SCIENCE for this miracle of pressure and temperature manipulation, which creates and moves heat via combustion-free Heat Pumps! Converting from oil or gas to Heat Pumps provides our region with immense economic opportunity. Of the 18.8 million crude oil barrels America consumes each day, 16% of it is burned for heat in homes and businesses. Of that demand, New England, NY, NJ, and PA account for up to 2/3rds of that total usage! New England alone, consumes more oil for heating, than it does for transportation, making our tiny rural region the most vulnerable to the volatility of foreign-governed oil prices. Residents in New England historically require 35% more heating than the rest of the Northeastern region. Our large heating market costs residents and business-owners over $14 billion annually in oil and gas costs alone. The Regional Greenhouse Gas Initiative is a mandatory market-based program created in cooperation by the states of Connecticut, Delaware, Maine, Maryland, Massachusetts, New Hampshire, New York, Rhode Island, & Vermont which aims to reduce greenhouse gas emissions 80% by 2050 in order to avoid the devastating effects of climate change related to power plant generation and other carbon intensive activities such as heating and transportation. Low or zero-carbon emission replacements for oil, gas (propane), and natural gas heating, such as Heat Pump technology, will be a necessary adoption in order to achieve this goal in the foreseeable future. For those that argue electrical power plant generation is carbon-intensive and contributes to pollution, I have good news! Vermont’s power generation is the least carbon-intensive state in the entire country!!! We are one of only two states in the U.S. without coal-generated power plants! 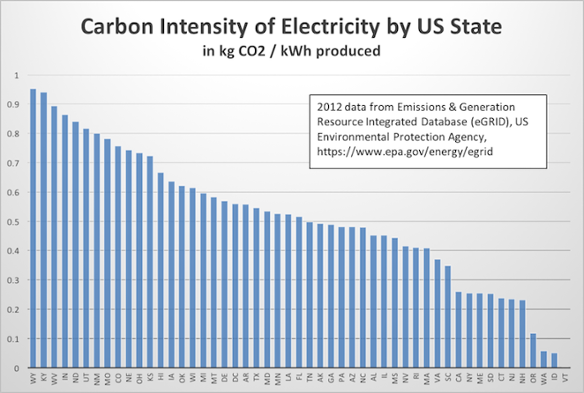 The Electrical Emission Factor for each state is determined by dividing kg’s of CO2 by kWh’s of electricity. Vermont’s Electrical Emission Factor is merely .002kg/kWh (see photo below). And as our electrical grid adopts more renewable sources (i.e. solar panels, hydroelectric- which accounts for 3/5ths of the states total electrical generation, biomass, windmills, etc. ), the carbon emissions from all generated electricity will continue to decrease even further. As our power grid continues efforts towards decarbonization through renewable energy sources, Vermonters can have confidence knowing that they’re Cold Climate Heat Pumps are running off the “cleanest” electrical power in the nation! Efficient on-demand heating and cooling all in one system. Flexible unit placement: Outdoor units can be mounted on a pad or hung on an exterior wall and incorporated into landscaping. Indoor units can be floor, ceiling, or wall-mounted (most common). With Cold Climate Heat Pumps you can heat and air condition your home with a “clean” renewable source, while reducing your carbon footprint, benefiting the environment, saving energy while saving money, and significantly improving your year-round comfort! Heat Pumps reduce peak load on our nation’s power grids, which in turn reduce transmission congestion and the associated costs. Local utilities incentivize renewable technologies such as Heat Pumps in order to reduce the overall demand on our power grids, as mentioned, and decrease the need for larger, multi-million/billion dollar power plants! With current rebate levels for single-zone heat pumps under 2 tons at $600 per heat pump, and multi-zone heat pump units over 2 tons at $800 per heat pump, homeowners can realize quicker returns on investment (estimated between 5-10 years), coupled with more reasonable installation costs, and quicker realized energy savings! These rebates were originally scheduled to end March 31, 2o17, however they have been extended through June 30, 2017 after which rebate levels are expected to be reduced significantly! 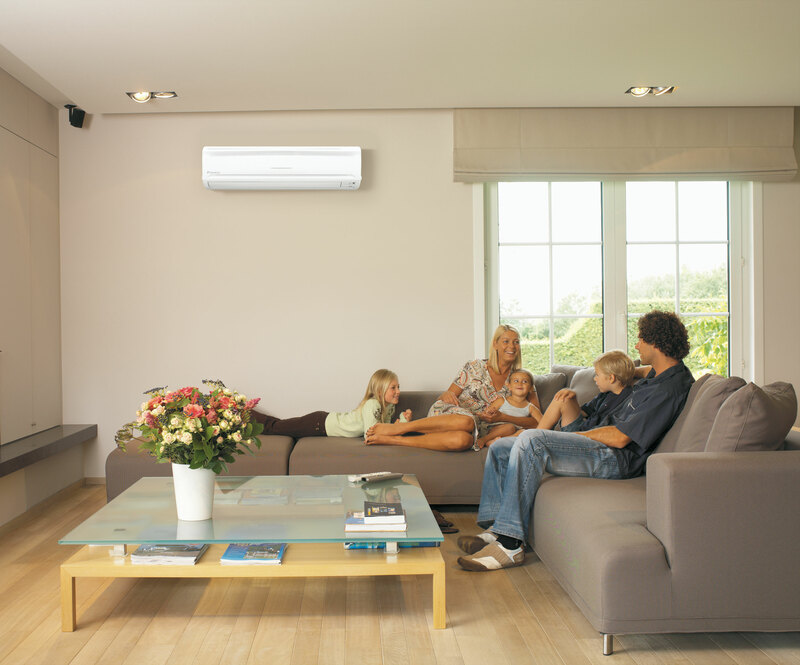 Consider Cold Climate Heat Pumps as a viable heating and cooling alternative! Keeping your money and heat sources local, directly supports the region’s economy and growth, while dramatically reducing pollutant emissions – improving your family’s health, and the viability of our global climate and ecosystem! ‹ Buy Quality Fixtures Through Your Contractor, Not The Big Box Stores!